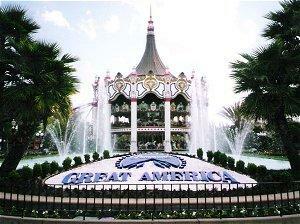 Great America was once a Paramount park. The Paramount amusement parks were a popular chain of theme parks coordinated with popular Paramount movies. Today, all the Paramount parks are still successfully operating, but no longer under the Paramount name. Themed Rides: A relatively plain roller coaster or carnival ride can become something extra special when distinctive music, special effects, and props are added to it to make a connection to a popular movie. Stunt Shows: Recreating special effects and daring stunts is a great entertainment option that puts park guests in the middle of the movie. Memorabilia: Movie props, costumes, signed scripts, and other memorabilia can be displayed near themed rides or in nearby displays for visitors to enjoy without needing to ride different attractions. Souvenir Shops: Selling exclusive movie-themed merchandise including collectibles, books, DVDs, clothing, and other novelties generates even more revenue both for the park and for the movie. Hollywood blockbusters routinely make millions of dollars, and movie fans are happy to travel to different locations to experience their favorite movies in person. This is the premise that made the Paramount parks so successful. In addition to these amusement parks, Paramount also operated related water parks, including Boomerang Bay locations at both King's Island and Great America, Raging Waters in San Jose near Great America, WaterWorks at King's Dominion, and Splash Works at Canada's Wonderland. The company also had a management contract with Bonfante Gardens in Gilroy, California, and with an amusement park in Spain. Though not strictly an amusement park, Paramount's most heavily themed attraction was Star Trek: The Experience in Las Vegas. It included a range of themed exhibits, Star Trek memorabilia, the Quark's themed café, souvenir shops, and more for Star Trek fans to delve into the future and experience their favorite television show and movies in person. Movie themes were connected to coordinating rides to add excitement and flair, and park guests were treated to trailers, clips, and posters in queues as well as costumed characters throughout the park to bring the movies to life. While under Paramount control the different theme parks grew and remained profitable, when Paramount split into Viacom and CBS it was decided to discontinue the connection to amusement parks. 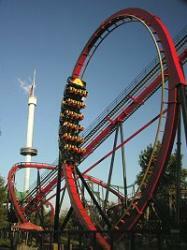 In June 2006, the parks were sold to the Cedar Fair Entertainment Company, the parent company of Cedar Point amusement park and numerous other amusement parks and water parks throughout the country. When Cedar Fair took over the Paramount parks, use of the specific movie themes was discontinued due to copyright considerations. Consequently, rides were rethemed to be more generic while still keeping their action-based elements. For example, the Top Gun roller coaster at King's Island was renamed Flight Deck and continues to operate with a fighter jet theme. To date, each park continues to be successful under its new ownership, and each park offers a range of thrilling roller coasters, family-friendly children's areas, world class entertainment, and other attractions for guests to enjoy. The only exception has been Star Trek: The Experience. Due to declining attendance and a lack of interest in continuing the project, the Las Vegas attraction was closed in September 2008. Plans have been made to relocate the attraction under new ownership to the Neonopolis mall in downtown Las Vegas, where it may reopen on a smaller scale. While guests may no longer be able to enjoy their favorite Paramount movies at world class theme parks, they can still be in the midst of the action at other movie-themed amusement parks. Universal Studios Florida, Universal Studios Hollywood, and Disney's MGM Studios still let guests ride such hit movies as Spiderman, Jurassic Park, Indiana Jones, Harry Potter, Jaws, and The Mummy. The Paramount amusement parks were a fun way to experience popular movies, and even though the parks are no longer under Paramount's management they are still exceptional destinations for a blockbuster theme park getaway.